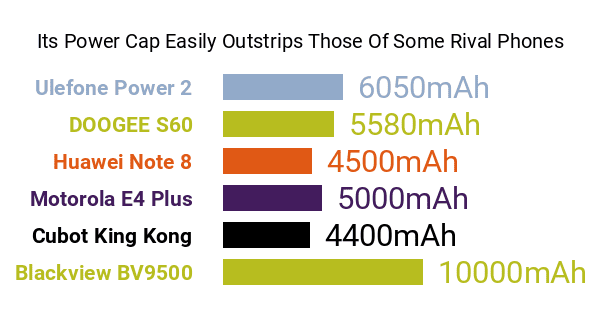 The epitome of a big-battery smartphone, at least around the time we were reviewing its technical pros and cons, the Blackview BV9500 blusters with a whopping 10000mAh battery sitting in its engine room, outstripping most of its rivals in the high-endurance category when it comes to raw power capacity. Its large battery powers up either through its 12V/2A charging system (It reaches full capacity in 3.5 hours) or through Qi-standard wireless charging. Its humongous battery aside, the BV9500 does not quite hit our expectations hardware-wise, settling for no more than 4GB of RAM and only 64GB of native memory . In comparison, several other big-battery contenders offer up to 6GB's worth of RAM and start out with 128GB on-board memories. 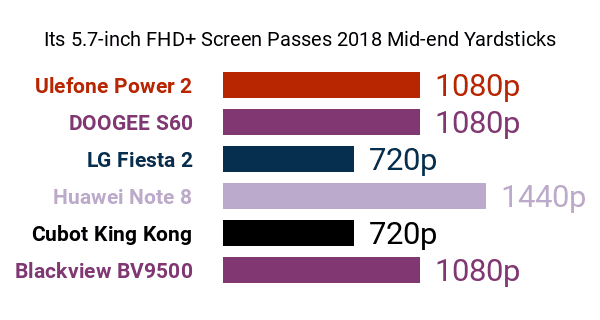 That said, its MediaTek Helio P23 eight-core engine, which clocks in at 2.5GHz , made it one of the fastest smartphones in its category as of this Phonerated analysis. The BV9500's specs are housed inside a 365-gram-heavy rugged shell that passes IP68 and MIL-STD-810G certifications , which essentially means that its body is impervious to dust grains and liquids and can withstand drops from up to 1.8 meters. Be sure to pop open our list of the best waterproof phones here to check out competing phones that share the aforementioned rugged pros. This Blackview phone's other features include a dual-rear camera system composed of a 16-megapixel primary cam and a 0.3-megapixel (VGA) depth-sensing cam that we flagged as a slight con, if only for its dinosaur-esque pixel resolution. Its front-facing camera comes in the form of a 13-megapixel S5K3L8-sensor cam with an f/2.0 aperture. Up front, it touts a 5.7-inch FHD+ (2160 x 1080) IPS display furbished with a Gorilla Glass panel, while the rest of its pros and cons include an edge-mounted fingerprint scanner, dual nano SIM card trays, and standard 4G network connectivity. Its 18.7mm-thick body is offered in Black, Yellow, and Green, with the Android 8.1 Oreo platform tying everything together. So, with a monstrous battery leading its pros, the Blackview BV9500 is easily a phone for outdoorsy users who value battery life over anything else.